Quercus rubra (Northern red oak, tree. Erik Danielsen. Henry Morganthau Preserve, NY. 8/2017. Quercus rubra is a tree to 50 m tall; to 120 cm dbh, red oak group (subgenus Erythrobalanus); bark dark gray, shallowly furrowed with wide, smooth, flat gray ridges, twigs hairless; growth pattern usually determinate (a single bout of stem and leaf growth early in season) but may flush once more under very favorable conditions (Marks 1975; Gargiullo personal observation); winter buds hairless 0.5-0.8 cm long, not angled; roots associated with ectomycorrhizal fungi (EM). 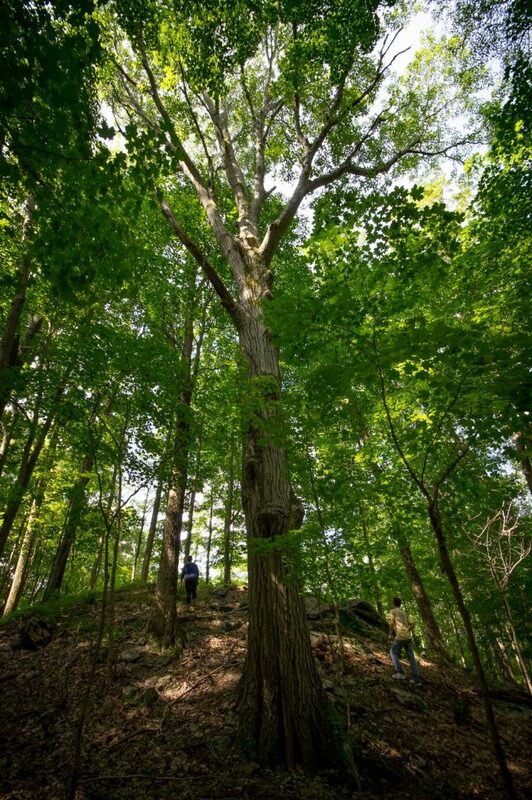 The most common type is Cenococcum geophilum, (Ascomycotina) but up to 26 other types have been found on the roots of mature oaks in the New York City region. The basidiomycete Scleroderma citrinum (earthball/ pigskin poison puffball, Sclerodermataceae) has also been found in association with red oak. Diversity of EM was 37% lower in urban soils than in rural soils (Baxter et al. 1999; Decker and Boerner 1997; Bills 1986). Quercus rubra.leaves. Paul Drobot.Robert W. Freckmann Herbarium.U. Wisconsin at Stevens Point.wisplants.uwsp.edu.jpg (Accessed 12/2014). 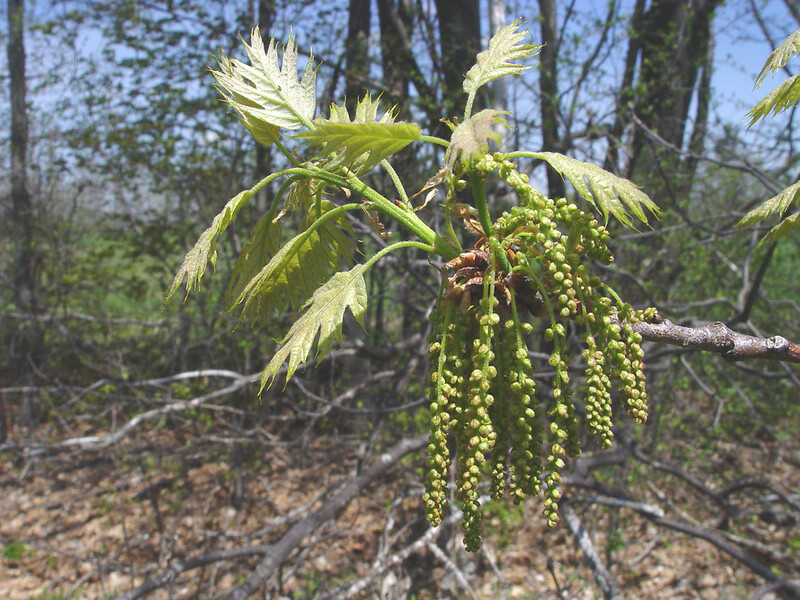 Leaves alternate, to 10-20 cm long, with 7-11 shallow bristle-tipped lobes, lobes not as deep as those of scarlet oak, each lobe often with 1-few coarse, bristle-tipped teeth, dull green above, hairless below, except for tufts in vein axils. Quercus rubra. By Donald Cameron male flowers. Copyright © 2017 Donald Cameron. New England Wild Flower Society. gobotany.newenglandwild.org (Accessed 8/2017). Flowers monoecious, green, male catkins, female flowers 1-few ver small; blooms April-May, wind pollinated, hybridizes with Q. velutina and other red oak group species. Fruit acorns 2-3 cm long, cap 2-3 cm wide, flat, very shallow, covering 1/5-1/4 of the nut, edges tucked in, saucer shaped, flesh bitter and astringent from high tannin content, matures in 18 months, Sept.-Oct. Acorns “mast” every few years, producing very large crops, timing depends on both weather and years since last masting (Sork et al. 1993). Seeds dispersed by squirrels, blue jays and other animals that bury acorns. Acorns eaten by many birds and mammals that do not bury nuts (raccoons, foxes, deer). Acorns germinate best if buried in soil but grow better if not covered by leaf litter (Garcia et al. 2002). Seedlings sprout the spring following dispersal. Acorn protein content 7% dry weight (Smith and Follmer 1972). 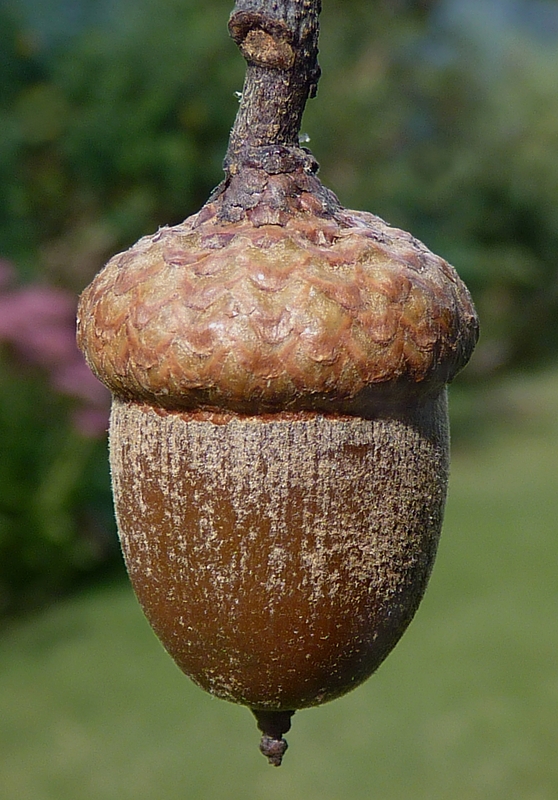 About 1 in 500 acorns lives to produce a 1 year old seedling. Seedlings grow slowly. Produces 1 growth flush per season. Able to resprout if damaged. Quercus rubra, female flowers. David Lee, Bugwood.org (Accessed 8/2017). Habitat: Mixed oak forests. Also planted as a park and street tree. Moist to dry soil from wetland edges to upland areas. Soil pH 3.8-6.5 Greller et al. 1990; Hightshoe 1988). Grows well on acidic, gneiss-derived soils (Balter and Loeb 1983). In NYC found on soils with pH 4.8-6.0 (Gargiullo unpublished data).Tolerant of ozone and salt. Moderately tolerant of drought, shade, index 7.8 (Hightshoe 1988). 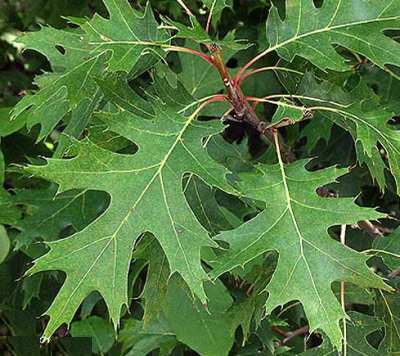 The most shade tolerant oak, red oak needs about 30% full light for maximum growth. 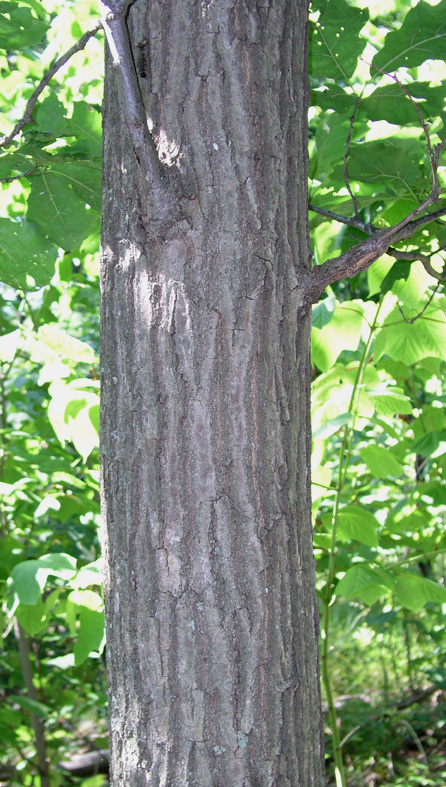 (equivalent to red maple, less shade tolerant than beech, sugar maple, more so than tulip tree, black cherry, or ash), P50 of 750 foot candles (Bazzaz et al. 1972). Leaves developing in full sun cannot use more than 40% full sunlight (saturation point) but those developing in shade cannot use more than 14% full sun (Hicks and Chabot 1985). Intolerant of, flooding. Less drought tolerant than white or black oak. (Whitney and Runkle 1981). Quercus sp. in the red oak group are generally less drought tolerant than those in the white oak group (LeBlanc 1998). Quercus rubra bark. George P. Chamuris, Ph.D.Hiker’s Guide to the Trees, Shrubs, and Vines of Ricketts Glen State Park.departments.bloomu.ed. (Accessed 9/2014). Notes: Growth rate slow, 1.66 relative to (relative to 0.99 for sugar maple; 9.24 Betula populifolia), (Grime 1965). Deer and rabbits eat twigs, other animals eat buds (Martin et al. 1951). Susceptible to fire damage that allows entry of fungal infections. Red oak is attacked by oak bark beetles (Pseudopityophthorus spp.) and sap feeding beetles (Nitidulidae) that spread potentially fatal oak wilt (Ceratocystis fagacearum, Ascomycotina). Oak wilt infects the xylem tissue and can kill a tree within a year of infection. This fungus may also spread through root grafts. Damaged trees may also be killed by shoestring root rot (Armillaria mellea, Basidiomycotina, Hymenomycetes). The fruiting body of this fungus is the honey mushroom (Lincoff 1981). Larvae of the red oak borer, Enaphalodes rufulus (Coleoptera), bore into the bark and feed on phloem and sapwood, weakening the tree and allowing infection by pathogenic fungi (see above). These insects are preyed upon by woodpeckers, ants and sapbeetles (Nitidulidae). Red oak is a favorite host of gypsy moth larvae (Lymantria dispar) which may kill trees by repeated defoliations. Larvae of the oak skeletonizer, Bucculatrix ainsliella (Lepidoptera, Lyonetiidae), feeds on soft leaf tissues, killing leaves and making trees more vulnerable to attack from wood boring beetles. The pink striped oakworm moth, Anisota virginiensis (Lepidoptera, Saturniidae) also feeds on red oak. Red oak leaves are also host to the oak apple gall. This is a round papery structure, at first green, later, turning brown, filled with delicate fibers with a central, small, dense ball of tissue that holds the larvae of a cynipid wasp Amphibolips confluenta (Hymenoptera, Cynipidae). 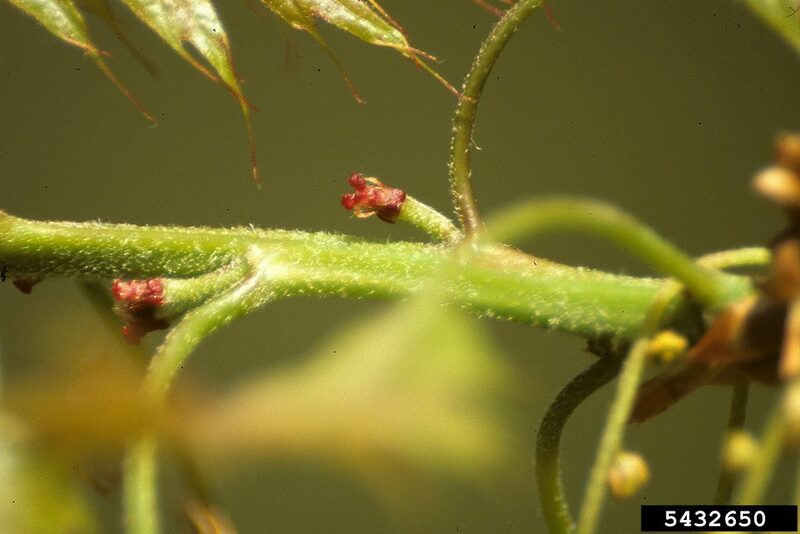 Oak leaf and twig galls are caused mostly by Cynipid wasps but also by some flies. Most do not do substantial harm to the host tree. However, the gouty oak gall, caused by Callirhytis quercuspunctata, injures twigs and can severely damage trees. This gall causes large, tumor-like woody growths along twigs that eventually kills them (see pin oak). Damage from larvae of the solitary oak leafminer, Cameraria hamadryadella (Lepidoptera, Lyonetiidae), is conspicuous as brown splotches on leaves. Leaf miners are preyed upon by numerous species of parasitoid wasps (Hymenoptera). Larvae of the oak webworm, Archips fervidana (Lepidoptera, Tortricinae), create a messy communal web around their feeding site that becomes filled with feces and leaf bits. Although conspicuous, these insects are usually not very harmful. Acorns are killed by nut weevils (Curculio spp. Coleoptera, Curculionidae) and gall forming Cynipid wasps (Callirhytis spp.) among others. Red oak is also susceptible to a bacterial leaf scorch caused by Xylella fastidiosa (fastidious xylem-inhabiting bacteria, FXIBs), (Burns and Honkala 1990; Johnson and Lyon 1991; Sinclair et al. 1987; White 1983; Covell 1984; Borror and White 1970). (See Q. alba for other insect predators). Red oak is considered to be a dominant tree in eastern deciduous forests but see Whitney 1994, p.78), especially valued for lumber. Quercus rubra is thought to be declining in numbers and has been the subject of many studies on regeneration by the forestry community. Suppression of fire has been sited as the principle reason for decline of oak regeneration. Some research points to correlations between increases in oak populations during the previous 3000 years or so, and increases in fires set by American Indians (Delacourt and Delacourt 1998). Other studies discount fire suppression as a reason for decline in oak population because fires set by American Indians were infrequent and scattered (Russell 1983; Clark and Royall 1996). However, other factors have been sited as factors in the decline of red oak in northeastern forests. These include: predation of acorns by increased populations of white-tailed deer, gypsy moth predation of foliage, over-logging and loss of habitat, all of which can decrease acorn crops. In addition, freezing temperatures or dry, cold winds during flowering may limit acorn production. It has also been pointed out that red oak is among the less fire tolerant species of Quercus and that it was a “minor component” in presettlement forests (Oliver 1978, Crow 1988; Johnson 1993; Auchmoody and Smith 1993; Auchmoody et al. 1993). But see also: Clark and Royall 1996; Abrams and Seischab 1997; Clark 1997). It should be noted that naturally occurring fires (without human ignition) are relatively rare in the northeast because dry lighting (without rain) is very infrequent. In the western United States, dry lightning (without human ignition) is a frequent cause of forest fire (Bothwell 2002). .